In the modern world, there are times when you need to buckle down and learn something new. It could be anything from a presentation at work to studying for a test when you want to achieve a higher level of mental clarity. And surprisingly, there is an herb that can help you reach your goal. 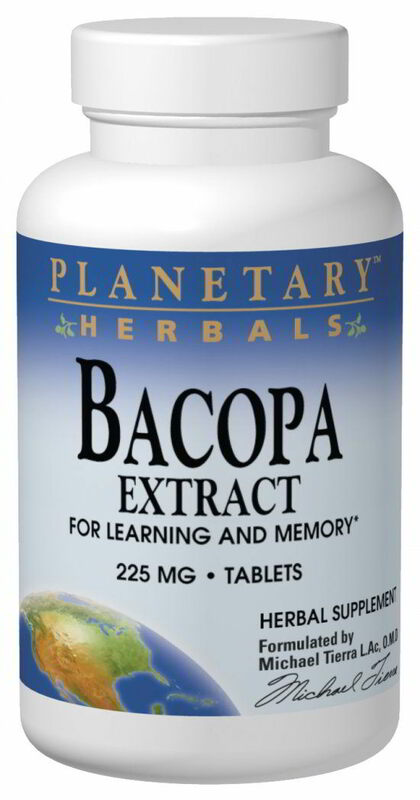 Planetary Herbals, the company that unites traditional herbal wisdom with modern clinical research, introduces Bacopa Extract - the smart herb for learning and memory. Bacopa Extract, made from Bacopa monniera, is standardized to 20% bacosides and has been used in Ayurvedic herbalism to support mental acuity for thousands of years. In modern clinical studies, this herb has been associated with learning and retaining new information. The primary principle of Ayurveda is to maintain a healthful balance of the mind and the body. A healthy mental state is a key factor in maintaining this balance, especially during times when you want to learn and use new information. Adults: 2 tablets twice daily. Children ages 12 and up: 1 tablet twice daily. Children ages 7-12: 1 tablet per day.